Did you ever play with Silly Putty when you were younger? The pinkish-beige putty that came in a red egg-shaped container? I always had high hopes that it would be like Play-Doh…soft, malleable. But Silly Putty is the black sheep of the putty family, and really no fun to mold at all. The most fun I had with Silly Putty was pressing it against the comic strips of newspapers to see it reprint on the the thick gummy goo. The last month or so I have felt like most everything has been hard. It’s been a season of one-thing-after-another problems, stresses, and disappointments. I’ve felt like I’ve been trying to push forward, but I find myself tangled up in circumstantial Silly Putty. Have you ever been there? Maybe you’re right there with me now. Solidarity, sister (or brother, as it may be). I’ve been trying to process it all. My head feels like it’s spinning from some of the issues that have come up, some relational, some financial, some small but weighty in light of all of the other mess. It’s those moments of loss, heartache, and disappointment that we are faced with the choice to hold onto what we believed when things were going well, or to forfeit belief and attempt to “go it alone.” It’s the hard seasons that make the difference in who we become as people of faith. Do we really believe that God is good when life is hard? Do we really believe that God is our rock and refuge when everything else falls apart? Do we really believe that He is with us, that He hears us, that He has our best interest at heart? “Though I forgot to prep the coffee pot, and my morning cup is empty. Though our well holding tank has rusted out and needs replacing. Though the baby is screaming, and I didn’t sleep last night. Though the mini-van engine has gone kaput. Though I can’t get caught up on chores to save my life. Though a loved one said such hurtful words. Though the blueprint of what I think my life should look like is far from what my life actually looks like. There are seasons in all of our lives when everything falls apart. The end is far from view, and we march on through what feels like endless Silly Putty. These are the times when God teaches us where our security truly lies. When everything starts crumbling, He is our steady foundation. When we are afraid of catastrophe, He is our fortress and hiding place. He doesn’t change even when our circumstances do. So while we can’t celebrate the brokenness, we can celebrate who He is in the middle of it all. Psalm 46 is such a powerful chapter that calls for our rest in the middle of Silly Putty moments (worse, actually). You most likely are familiar with the verse that says, “Be still and know that I am God.” But what’s so powerful about that verse is that it’s a commandment in the middle of global catastrophe! The images used in the whole Psalm are ridiculously scary! (Did you see 90’s movie Deep Impact? Yeah…legit Armageddon stuff. Walls of water, mountains crumbling, and the like). Wherever you are. Whatever you are dealing with. Whatever chaos is surrounding you. Stop today and consider the bigness of God. Consider His promises that He never changes, and that He is very present with you (even when you can’t see, feel, or hear Him). Take this moment right now and consider that in the middle of your Silly Putty He is powerfully moving. He is rock steady. Be encouraged, dear friend. The story isn’t over. Our God is mighty, and the floods of life do not threaten or intimidate His position or authority. This week has left me speechless. Our world–near and far– is so horribly broken. Sickness, death, war, and trauma abound. None of us can say we have never hurt deeply. We are all very, very broken, and we all need a Savior. As a mother, I adore my son. He is precious to me, and I enjoy him simply because he is mine. Like most children, he has days that make me want to pull my hair out. Some days I fight him tooth-and-nail to listen and obey, and to understand that I love him and want good things for him.. Some days I just want to cry from sheer frustration when his strong will and my own collide. But no matter the day we had, if my son wakes up in the middle of the night crying because he is scared, I go to him. It doesn’t matter how frustrated I may have felt during the day. I love him fiercely, and I don’t want him to be scared. I want him to trust that I will be there when he needs me. I want him to know he is safe, loved, and that I am with him. I can’t make the sun come up, but I can be with him in the darkness. I have to believe that God feels even stronger about us. We are pitiful, sinful beings that often distrust the God that loves us and wants good things for us. And yet He loves us with an everlasting love. In spite of our sin, our shame, and our guilt, He has has come to us in the middle of our nightmare and rescued us. We are not alone in the darkness; our God is with us. He doesn’t always immediately take away the pain, but the morning will come. Until then, we are not alone. The Lord allows us to experience difficult, trying times not to show himself as a God that will beat us into submission, but rather to show the intimate nature of His love and compassion towards us in spite of ourselves. It is easy in the darkest times to believe the lie that God no longer cares, that He has forsaken us, that He doesn’t love us. It is easy to believe that we are being punished. In that hard season of my life, I believed I would never be better, and I would be left to rot in the wilderness. But that season is now one of the fondest of my spiritual life because I look back and see God’s goodness, tenderness, and kindness to me in the midst of my doubts, fears, and brokenness. 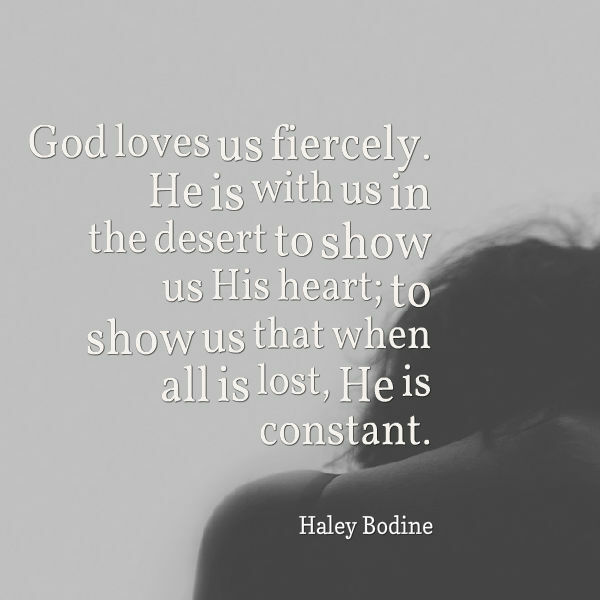 God loves us fiercely. He is with us in the desert to show us His heart; to show us that when all is lost, He is constant. Maybe you are suffering tremendously. Look to Him. He has come for us like a good father goes to his child. He loves us with a radical love that changes us. He is able to take the Valley of Achor (the valley of trouble) and make it a doorway of hope. How have you seen God move through tragedy and pain in your own life?